A baby girl is on her way! That’s right. My husband and I are expecting a baby girl later this fall and at 24 weeks we’ve already given her the name Madison Grace! Her announcement on PKU Parlor might help explain why I haven’t posted in a while. Finding out I am pregnant has been both overwhelming and wonderful at the same time. The editor in me wanted Madison’s announcement to be partnered along with some insightful advice for my blog readers, but to be honest, I’ve never felt as such a “newbie” towards anything else in my entire life. While working through all the normal questions and concerns that most women have with their first pregnancy (visiting day care facilities, finding a pediatrician, planning maternity leave, etc. ), I’m also working through what it means to be expecting with PKU. 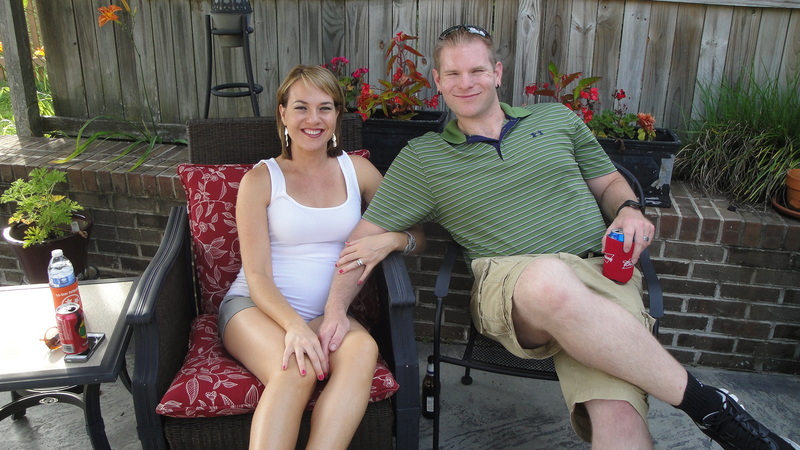 Me – sporting an 18-week baby bump – and my husband Brandon on June 14, 2014. 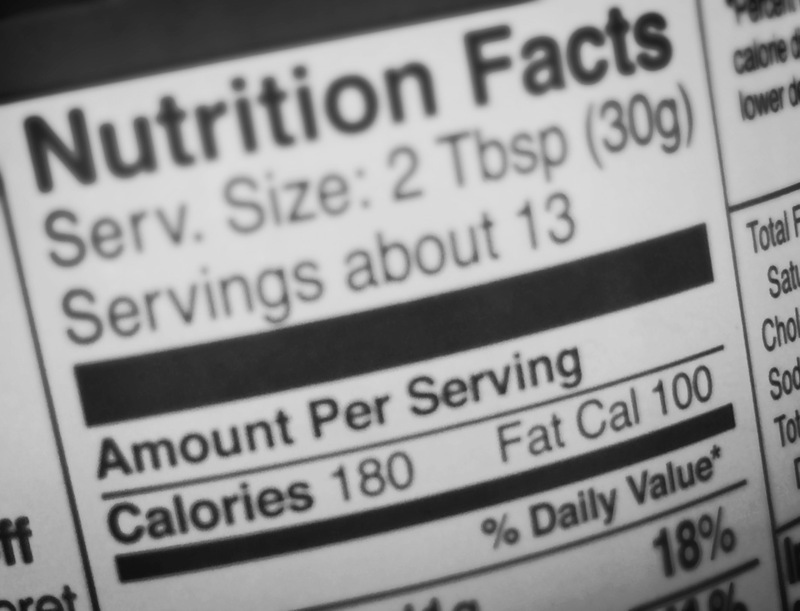 Longtime blog readers may recall after returning to the low-protein PKU diet in January 2013, I began a long journey filled with a variety of hurdles including the inability to keep consistent insurance coverage for my formula, the emotional impact of a dramatic hair loss, and the hunt for a medical team that was experienced and refreshingly optimistic about tackling maternal PKU. And yet once I felt that all the pieces had fallen into place, conception was not something that happened instantaneously. Negative pregnancy test after negative pregnancy test eventually began to take a toll and I started to wonder if becoming a mom would ever happen. Despite my skepticism, I was surprised to learn I was pregnant during a routine OB visit this past April. And when my first ultrasound determined I was more than 10 weeks along, I was even more surprised to learn I had nearly missed-out on my first trimester! …Certainly a perfect example for why returning to the diet prior to conception is so important. In the weeks leading up to finding out the good news, my PKU clinic and I had been trying to figure out why my levels appeared to be gradually increasing despite no change in my daily phe intake (in hindsight, it was likely because my body was working hard undergoing massive changes to make a baby). As soon as I reported the pregnancy back to my clinic, the decision was made to drop my phe by 50 mg to 500 mg/day (or 10 gm of protein) and increase calories to a minimum of 2,300/day (more for those days when I exercised). Sure enough, the adjustments quickly brought my levels back down. It is hard to believe it’s been 14 weeks since I first found out I was pregnant. I grin from ear-to-ear every time I feel Madison kick. Her acrobatic stunts are a constant reminder that all this hard work is so worth it! In the coming days and weeks, I’ll share more of my experience as well as other PKU recipes and tidbits. I hope you’ll continue to stop by! Is taking-on maternal PKU a rational decision? Some blog followers may have noticed that I have taken a short hiatus from posting content. My absence has in large part been attributed to the fact that I spent the latter part of January, all of February and the beginning of March battling for access to my prescribed PKU formula. Despite having insurance coverage, the durable medical equipment company I had worked with for over a year decided they were losing too much money, cited it as a “reimbursement issue,” and claimed that it was perfectly legal to deny me access to the formula. I spent the next days and weeks attempting to liaison between my employer, my health insurance provider, the formula manufacturer and alternate DME companies. I embarked on an extensive letter-writing campaign and spent many weeks living day-to-day, wondering where my next supply of formula would come from, whether I needed to leave work early to pick up an emergency supply from my local clinic, and so forth. I go into all of this to belabor my next point, something that has been weighing heavily on my mind: Will I ever feel confident enough to take the next step and transition my “return to diet” into a “preconception diet?” After being off diet for nearly 19 years, I recently returned to the low-protein diet and have been working hard to adhere to its limitations for nearly three months now. For some clinics, that is long enough before women with PKU can conceive. Other clinics recommend six months, but whether the recommendation is three months, six months or an entire year, I do not know that the uncertainty surrounding treatment for maternal PKU will ever improve. Two recent, yet very different, pieces of literature caught my attention and magnified this dilemma further. The first, which was passed along to me by another PKU advocate Kevin Alexander, is a peer-reviewed, academic journal called Genetics in Medicine. 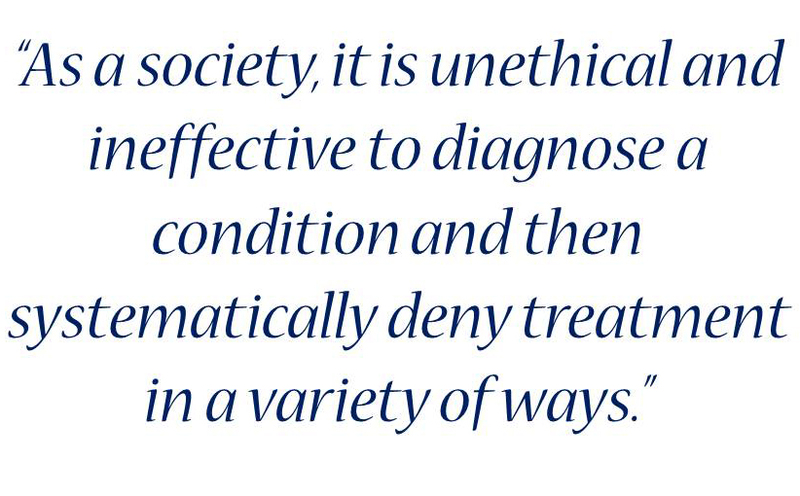 Published by the American College of Medical Genetics and Genomics, the March 2013 issue reviewed the 50th anniversary of the U.S. newborn screening program and looked at the barriers that still prevent access to PKU treatment five decades later. Many barriers were examined including the limited number of adult clinics; the lack of third-party payer coverage; transportation-related issues; and perhaps one of the most commonly ignored barriers, social and mental health support. 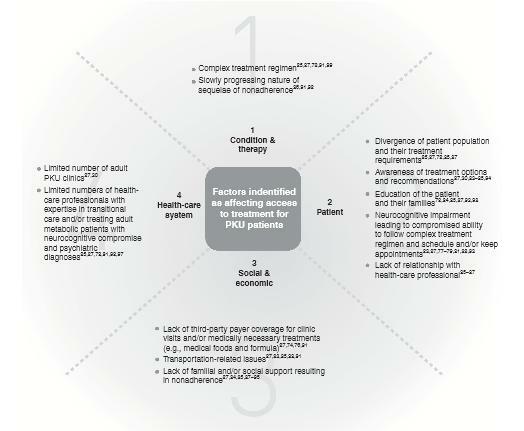 Factors identified as affecting access to treatment for phenylketonuria. Source: Newborn screening 50 years later: Access issues faced by adults with PKU, Genetics in Medicine, 2013, doi:10.1038/gim.2013.10. I guarantee that I am not the only woman with PKU who does feel so moved, to have a part in creating a whole greater than oneself. Unfortunately, women with PKU do not fall within the category of “most people.” The very personal decision of whether or not a woman with PKU will attempt a pregnancy does in fact involve logic and debate. I have experienced many debates…sometimes with friends and family and other times with my self-consciousness. Is a PKU pregnancy is a wise decision, especially given all the unknowns that are seemingly beyond my control? As a good PKU friend of mine in New York once told me, there are no happy accidents when it comes to maternal PKU. The demands that maternal PKU places on a woman are great indeed. The decision is big. The hurdles along the way will at times seem insurmountable. Given the current state of the healthcare system and all the barriers that still exist, one almost has to be irrational to finally take the plunge. Of all places to find philosophical inspiration for living with PKU, I came across this profound quote while visiting my local gym the other day. Charles Swindoll, the author of this quote, is an evangelical pastor who I had never heard of prior to seeing this quote and subsequently Googling his name. Clearly, the owner of my gym was trying to speak to the mental strength it takes to improve one’s physique, but anyone who reads this passage will likely apply it to their own personal situation. As such, when I read this quote, I immediately think about my struggle to start a family. Growing up with PKU, I’ve always felt – even at a very young age – that successfully having children would be THE biggest accomplishment of my life. That is because I have always had a keen understanding of the great effort and sacrifice it would take to return to a restricted diet. I knew that mental toughness and fortitude would be paramount for getting me through. Yet it wasn’t until recently that I realized a host of external factors – items beyond my control – could also sabotage the success I so greatly desired. Perhaps I need to redefine what I mean by “successfully having children.” Even though the suggestion cut deep on an emotional level, maybe I do need to take a second look at adoption or foster care. Does it matter to me and my husband that our children be a reflection of who we are genetically, or can we learn to love another child who is in need a good home? Or maybe thinking rationally means recognizing that we’ll become parents when the time is right. Even when it seems co-workers, friends and family members are all starting families, perhaps our turn is just around the corner…when some other opportunity arises. Reading Swindoll’s quote hasn’t exactly changed my life or provided me with all the answers, but it does help put things into perspective. I’m not going to settle for a less-than-desirable situation or passively accept the way things are. Instead, I must use my drive…my attitude…to find another way. What support systems do participants have that either help or hinder adherence to dietary management? From the participants’ perspectives, what can be done to improve support for ongoing dietary management within the clinic service? For all of the women who participated in Regis’ study, family members were identified as being the greatest source of support. Mothers in particular were mentioned not only as a supporter but also as an individual who truly understood and empathized with what it was like to struggle with the low-protein diet. Other examples of how family members provided support included finding new recipes to cook or share with the PKU patient, or even in some cases, helping to pay for costly medical foods. With regard to the support participants received from clinics, most felt that clinicians were friendly and supportive, but some concerns still existed. For example, some participants felt like information about new foods and treatment was only provided if the patient asked about it. Clinic staff did not always provide individualized advice and overall communication from the clinic occurred less frequently overtime. The reality is that most PKU clinics are spread-thin and overworked because of having to respond to more than just PKU patients. But developing specialized care for maternal PKU is significantly more complicated than just refreshing clinical best practices. That’s because as Regis acknowledged, treatment for PKU has evolved over the years, allowing for more PKU patients to live longer and engage in “traditional” lifestyle activities such as pursuing advanced college degrees and starting families. Unfortunately, despite the need for individualized care, many PKU adults are still seeking treatment at a pediatric-focused facility such as Children’s Hospital. To be fair, participants within Regis’ study did not explicitly express concerns about receiving care from a pediatric institution; however, there was strong agreement on the need for more support beyond education. A distinct population – even one that is a subset of a group defined by a rare genetic disorder – should translate into individual, specialized care. 4. What is the knowledge level of the participants regarding PKU and maternal PKU? 5. How does knowledge level regarding PKU impact decisions regarding birth-control and family planning? Why would Regis focus on the knowledge level of the adult women with PKU? For the last two decades, PKU research has focused in large part on emphasizing the need to educate adult women with PKU so they could better self-manage their condition and prevent the occurrence of maternal PKU syndrome. Regis wanted to “gain a better understanding of the ways in which a children’s hospital-based metabolic specialty clinic may best serve them [adult PKU women of childbearing age].” Was the answer that clinics should continue to serve maternal PKU patients by following conventional research, which emphasized the importance of ongoing education? Or was there a need for something more? To explore these options, Regis started with the knowledge variable and had the six participants take the Maternal PKU Knowledge Test, a 10-question quiz that was developed in 1990 by Shiloh, St. James and Waisbren. The three authors recommended the test as a way for clinics to screen and identify adult women with PKU who might benefit from more education. With regard to how the participants’ knowledge level may have impacted their family planning decisions, all of the participants reported that PKU strongly influenced their decision about whether or not to have children. Regis noted that one participant commented that she was afraid to have children because of the possible outcomes, while another participant who originally wanted a large family said that concerns over the PKU diet changed the number of children they would ultimately plan for. Observations within the study also revealed that even though there were 12 pregnancies among the six participants, only four resulted in live births. So one begs to ask the question: If these six women were relatively well-informed about the risks associated with maternal PKU…AND if knowledge of those risks, as well as ways to minimize those risks, impacted the decisions these women made with regard to family planning, then what else could be the reason behind such a low pregnancy success rate? Stay tuned for the concluding post in this three-part series on Caring for Maternal PKU. 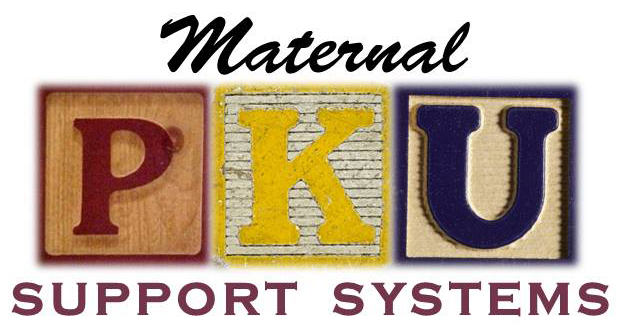 Assuming that education alone may not be enough to improve pregnancy success rates among adult PKU women, Part III will take a look at the support systems available to the participants in Regis’ study.